Just be very careful if the second unit has a KITCHEN! Why is a second kitchen something to be careful of? Do you have any additional intel on the answer to this question since you asked it 4 years ago? Hi Wendy. I don’t. I think sometimes we hear things like, “Two kitchens are not allowed.” I would defer to local code on this for the definitive word on what is legal. This can be a complex and time consuming endeavor to sort out, and it is important to get it right. The bottom line is you should rely on Ryan Lundquist, who is obviously your Sacramento area expert, to sort this out for you! You bring up an interesting dichotomy. County Departments can be like silos, completely independent of each other. Once while trying to help a seller obtain permits for a second structure on a property, we found that while the Building Dept was unaware of its existence, the Assessor’s office had been aware of it (and adjusted the property valuation because of it) for over a decade. It actually helped the owner document which code was in effect at the time of construction and he was able to get the building permitted retroactively. More and more the real estate industry is involved in point-of-sale permit-updating. That’s wild Jane. Thank you for the story. This underscores the reality that the Assessor may tax you on what is there in some cases regardless of whether it is officially on the books as legal. It sounds like it worked out well for your client. Congrats! Please play nice Commercial Appraiser. That’s my rule here. Mike could very well be talking about figuring out if it is permitted or legal, right? This is definitely not always a straightforward issue to interpret. This week I just appraised a property where an owner spent $20,000+ on what was called an “accessory dwelling”, though it didn’t have a kitchen or bathroom, so I basically called it an outbuilding. It was perfect for a home office, and I assigned some value to it, but it definitely did not fit the requirements to be called an accessory dwelling unit. What kind of loan will cover a two unit property? (2 separate and legal homes on one lot). Hi Lin. I think this is where you’d want to talk with a loan officer. In terms of financing, I’ve seen two houses on one lot go conventional or FHA though. That’s interesting to hear Cory. I have seen FHA buyers purchase duplexes and fourplexes many times (and conventional too of course). FHA and conventional should be good with 1-4 units on one lot. Anything beyond 4 units is considered commercial property, which wouldn’t work. Can a home with in law suite (full kitchen, bathroom, bedroom and sepeeate entrance) be considered a second unit? Would it qualify for FHA loan? Hi Sheena. You called it an “in-law suite”, so it sounds like it’s probably more of an accessory dwelling than anything. Of course it’s possible it could be considered a second unit because a second unit also has a kitchen, bathroom, and bedroom at the least. Though to know fully we have to consider many of the things outlined in this post. Sorry I cannot be more specific in my answer regarding the situation you are thinking of. FHA does loans for 1-4 unit properties. I see people buy 2+ unit properties all the time while doing an FHA loan. It is no problem either to finance a single family home with an accessory unit. That happens all the time for FHA and conventional financing. That’s interesting to hear Cory. I won’t pretend to know the nitty gritty of loan details and why it couldn’t move forward with both dwellings. Part of me wonders if maybe one of the dwellings wasn’t legal somehow (maybe the manufactured was too large or something). Or I wonder if the issue was the farm instead of the number of dwellings. I’d love to hear any loan officers pitch in some thoughts. Thanks for the follow-up. Very well done article. I will have to read up on any other topics you may have written about. If a home owner rwnts her basement out with con ed included, is it legal? And do you think she has a seperate meter? Hello my name is Justin, this is the only place that I have been able find some clarification to a possible garage conversion into a habitual living area. My wife is from Southern California and her parents like be to visit own newborn. They would like to come up more often, so my family and I came up with an idea to convert a garage into a habitual living unit. However, the property my parents own is a duplex. I emailed the planning division and they replied “The zoning of the property is ‘Single-Unit Dwelling’ (R-1). The site is already developed with 2 dwelling units, a 3rd unit cannot be established under this zoning.” Is there a way to convert the garage into a habitual unit? Like an in-law quarter? Or accessory dwelling unit? So that planning would be ok with this? Hi Justin. I think this is going to come down to how the city views an accessory dwelling unit. If they classify the accessory unit as a full-fledged unit, then you may be out of luck. Though if they distinguish between an ADU (accessory dwelling unit) and a full-fledged second unit, then you may be okay to convert the garage. Keep in mind the way appraisers view properties for valuing and the way a city might classify a property can be two different things. I would simply ask if it was possible to do an ADU in the garage and see what they say. Or you may consider asking if it was possible to convert the garage. If they said NO to the ADU, maybe they could still convert the garage with a bathroom and sleeping room, but no kitchen. That wouldn’t be the end of the world as I imagine you might share most meals together inside the house anyway if they reside in the duplex. Or it may be possible to do a kitchenette somehow that would still work under the guidelines of code. In Chicago and many areas around Chicago, the first question should be, “Is it legal, is it legal non-conforming or is it an illegal use of the property.” Most often when a realtor advertises it as a “Mother in-law unit,” it simply is another way of saying it is illegal. The City of Chicago and many other areas near Chicago, if the City, Village, Town, County or whatever the governing municipality is finds out about it either by a complaint or by the owner applying for some other type of permit, they must disable the kitchen. Usually this means removing all kitchen appliances and stubbing the gas line for stove inside the wall and sealing up the wall. Thus, since they are usually illegal, even if it has market acceptance, Appraisers in our area should not give it any value as an additional living unit, but simply as additional finished common area, which may have a potential to be duplexed into another living unit. If it is a legal living unit, then that means it really should be on a multi family form and not a single family form. 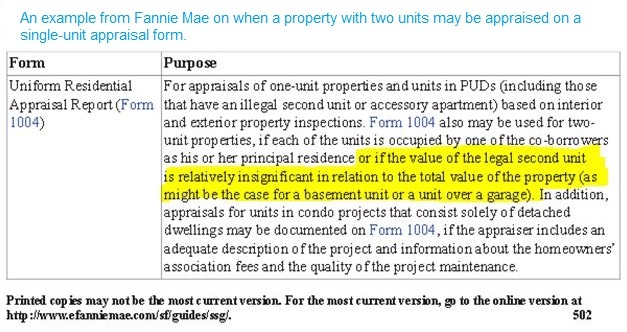 If the supposed ADU can be rented and it is legal or legal non conforming, then it’s a multi family property that goes on a 1025/2-4/SRIP form for Appraisers and not the 1004/URAR. In Chicago at least half of these in-law units are illegal, the other half are about equally divided between being legal or legal non-conforming. While I have nothing to back up those numbers from another resource, it’s based on my short 42 years as an Appraiser and my small staff of 10 Appraisers working for me and my 20 years as an Appraisal Instructor. In CA and other areas it may be very different, but that’s how it is here in our market. Thank you Donald. I appreciate your thoughtful comment and insight. I think that’s a great starting question. What is legal? what does zoning allow? We have to know this. I appraised something recently where zoning did not allow an accessory unit, but that’s the way the property was marketed. Well, it turns out someone is getting sued now because the unit was really only suitable to be a home office rather than a rental. This is where zoning matters greatly. Things might be different in Chicago of course, but from your comment I wondered if you think there is a difference between a legal accessory dwelling and a legal second unit? In my mind there really is as I attempted to describe in this post. But it sounds like you maybe don’t think there is a difference? The 1004 of course provides a check box for an accessory unit, so it would seem fitting in my mind to put the property on that form. Moreover, the front house is not often rented when there is an accessory unit, so if we put it on a 1025 then I’m not sure how valuable the Income Approach can be if we don’t really have rental data for both units. I find in my area at least it’s doubtful that I’d find comps where the front house is rented as well as the accessory unit. Traditional two-unit homes of course are both rented, but I don’t find that to be the case for a SFR + ADU situation. I’d love to hear your take. Thanks again for chiming in. I’m fascinated to hear how things work in other parts of the country too.